Reflecting their devised creative process and provocative productions, Belgian company Ontroerend Goed’s collected works, All Work and No Plays, is an iconoclastic document from a company who question the boundaries of theatre. A series of texts that claim not to be definitive representations of the works as performed, but a broad representation of each show’s general shape and structure, the company offer their words as a guide to the recreation of their first nine performances. Because of the loose nature of the company’s work—and its emphasis on the engagement of the audience—most of the scripts include a notional spectator’s thoughts and emotional responses to the performance. Their earliest pieces (collected as The Personal Trilogy) are examples of intimate theatre, for either a single audience member (The Smile Off Your Face) or a small group (Internal) and set the tone for the publication, alternating between descriptions of the performers’ actions and the possible feelings of the audience. Although the intention of the book is clearly identified as an encouragement to other theatre-makers to adapt Ontroerend Goed’s performances to their own needs, the range of styles on display—Teenage Riot almost feels like a traditional script in places, while A History of Everything is presented as a collection of notes and meditations, defined more by stunning design than content—operates as an introduction to the company’s devising aesthetic and philosophy of theatre. 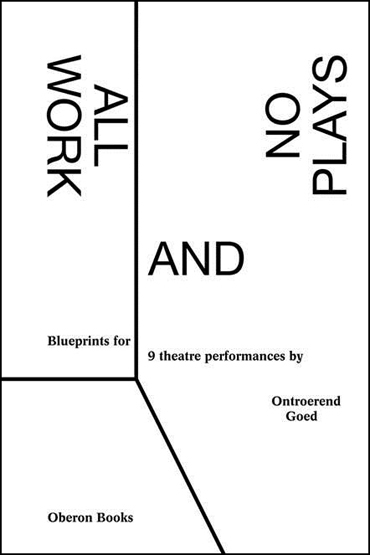 As such, All Work and No Plays is important reading for anyone interested in the potential of performance to escape traditional format and challenge audiences, or indeed the recent history of European devised theatre. If each of the texts for the performances follow a similar pattern, suggestive of what can or did happen in performance rather than a didactic script to follow, the introductions to each text are consistently enlightening. From The Personal Trilogy through to Fight Night (the last of the texts printed here and a powerful entry in the 2013 Edinburgh Festival Fringe), Ontroerend Goed have confronted audiences with a bleak vision and manipulated the format of theatre to challenge expectations. Teenage Riot addresses the fears and aspirations both for and about young people; Fight Night savagely deconstructs a democratic process to reveal how easily it can slip into demagoguery. And in the introductions, Ontroerend Goed reveal their own intentions. Certain themes are revisited: a surprise at the controversy their work receives; the importance of following the performers’ process during the making of theatre; a restless desire not to repeat the format or style of earlier pieces. That the texts are all credited to Ontroerend Goed rather than the individuals involved in the making follows the rehearsal process described for Once And For All We’re Gonna Tell You Who We Are So Shut Up And Listen (p.173) or The Smile off Your Face (p.17): the collective is more vital than the individual. The inclusive approach of the devising process may appear at odds with some of the outcomes—Audience descends into a video sequence that refuses to distinguish between the group dynamic of civil rights marches and football hooligans on a rampage (p.437), while Fight Night concludes with the question of ‘whether their vote really matters’ (p.525). Yet the introductions suggest that Ontroerend Goed’s intentions are compassionate: the challenges to the audience are described as finding out ‘how personal we could get without losing the theatrical footing’ (p.71) or wanting ‘to get under the audience’s skin, rather than forcing them to be defensive’ (p.396). It is this tension—between the positive intentions, and the apparently nihilistic message of their shows—that drives their dramatic impact. It also provides the impetus for the most challenging aspect of these texts: the inclusion of a putative audience experience. While the audience’s response is an attempt to recognise the role of the audience in the creation of meaning, and certainly clarifies the intentions of the various scenes—something which the company place above more traditional text concerns like the script as written—it also undermines the reader’s ability to interpret much of the material. At times, it may be optimistic (the mentions of feeling comfortable in the early works may be wishful thinking, as no-one feels that comfortable blindfolded and handcuffed), or suggesting too easy a connection between the company’s aims and the audience’s understanding. By the time of Fight Night, the intention of the company has become more vague (they suggest that both Fight Night and Audience are provocative rather than didactic), and so the actions of the audience are described, yet the originality of the format, and the persistent shifts of perspective are dazzling and confusing. In some sense, this mimics the experience of an Ontroerend Goed event: technically brilliant, disturbing and intelligent, shifting between ideas and emotions relentlessly. Alongside the hints for other makers to recreate these performances, this could be the most powerful part of the book. Combined with its idiosyncratic yet coherent design, it allows the texts to stand out against mere publication of scripts. However, it also highlights a problem: without previous knowledge of Ontroerend Goed’s oeuvre, it becomes difficult to imagine how each text would have been staged, to gauge the real relationship between stage and auditorium or feel the emotional impact of what appear to be highly theoretical and formally experimental dramas. While the tone of the book captures the company’s adventurous approach, its diverse influences and obvious enthusiasm for experiment (and a restless energy) it naturally loses the immediacy of the productions. Without having seen them in action, it is hard to translate the ideas from page to the stage of the imagination. Nevertheless, it is an entertaining read that flickers through the company’s history and struggles, and marks their journey from outsiders making one-to-one shows to the large-scale theatre of Audience and Fight Night. And, through the complexity, it offers an insight into the most consistently challenging theatre-makers of the past decade. Gareth K. Vile is the theatre editor of The List, a recent graduate from the University of Glasgow and a determined blogger. He threw a shoe at Ontroerend Goed, which is mentioned in the book, but more from a sense of engagement than outrage. He is known for his experimental approach to popular criticism.